Windows Ink Workspace is a new feature introduced in Windows 10 Anniversary Update, which makes pen input more usable for everyone with a PC. Within Windows Ink Workspace, you can use a digital pen to write sticky notes, doodle in Sketchpad, take a screenshot of your desktop and load it for your sketching. 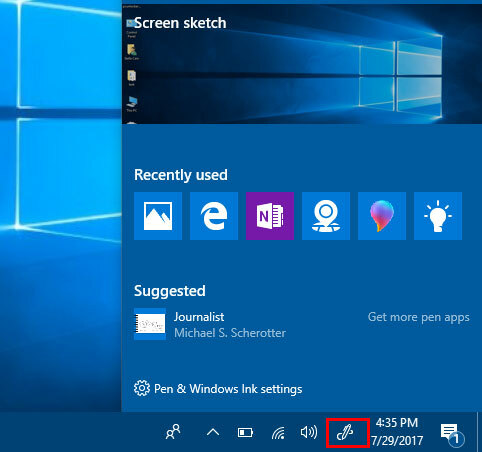 If you don’t have a digital pen or you want to remove Windows Ink Workspace icon from your taskbar, here are 2 easy ways to disable Windows Ink Workspace in Windows 10. Open the Local Group Policy Editor. Navigate to: Computer Configuration ->Administrative Templates ->Windows Components ->Windows Ink Workspace. 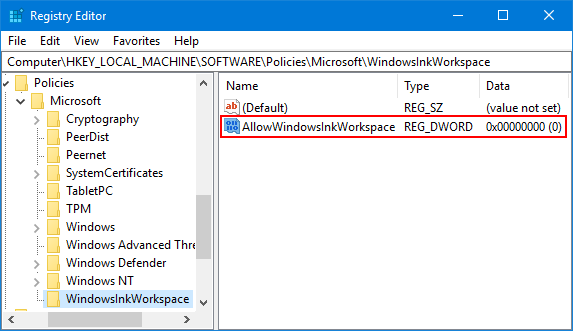 In the right side pane, double-click Allow Windows Ink Workspace to open its properties. Check the Enabled option. Next, select Disabled from the drop-down menu under Options section. Click on Apply and then OK. Restart your PC to make the changes to take effect. Right-click the Microsoft key in the left pane, and then select New -> Key. Name the Key as WindowsInkWorkspace. Now, select the WindowsInkWorkspace key. Right-click empty space in the right pane, select New -> DWORD (32-bit) Value. Name the DWORD value as AllowWindowsInkWorkspace. Leave its value data as 0. Restart your computer. Once signed back in, you should see Windows Ink Workspace disabled. 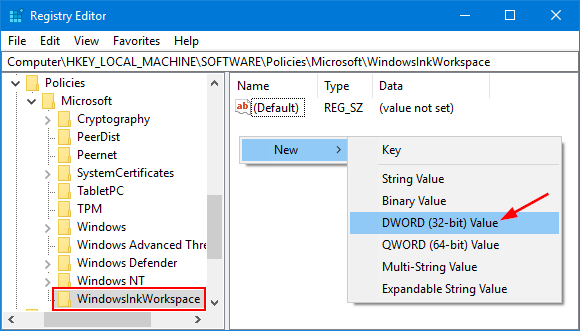 If you want to enable Windows Ink Workspace again, just follow the steps above and change the DWORD AllowWindowsInkWorkspace value from 0 to 1, and restart your computer. Sharing tab missing in Folder Properties on Windows 10? 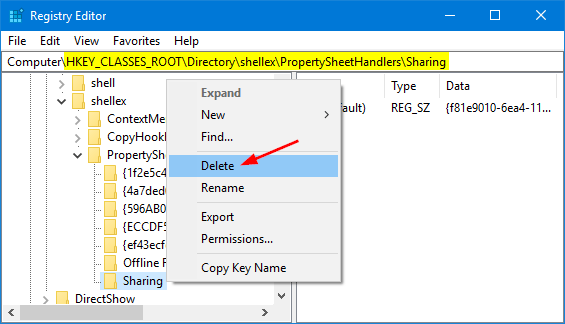 If you want to share a folder with other users, just right-click on the folder and select Properties, and then go to the Sharing tab in the Folder Properties window. Sometimes you might find the Sharing tab goes missing. 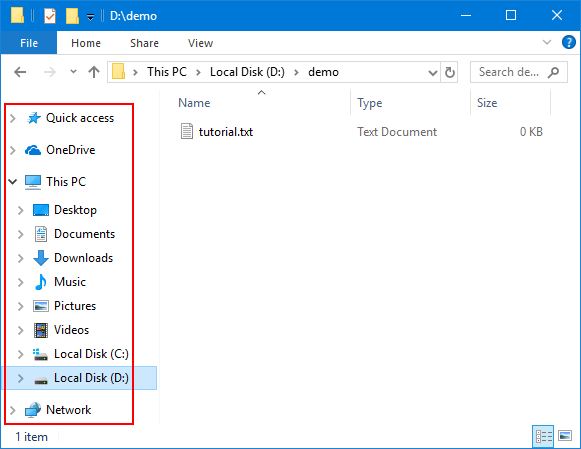 In this tutorial we’ll enable or disable Sharing tab in Folder Properties for all users on Windows 10. Press Windows + R keys together, type regedit in the Run dialog box and hit Enter to open Registry Editor. Right-click on the Sharing key in the left pane, and then select Delete. 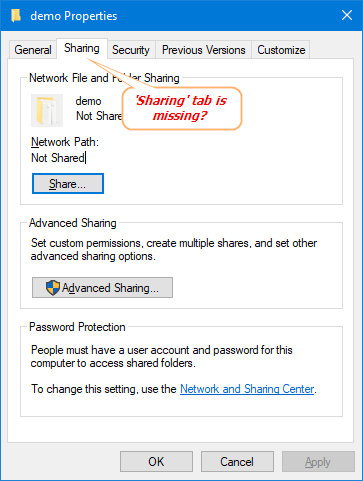 Now, bring up the Folder Properties dialog and you’ll find the Sharing tab is disappearing. If the Sharing key doesn’t exist, right-click on the parent key and select New -> Key to create it. Highlight the Sharing key and go to its right pane. Double-click on Default string with type REG_SZ. 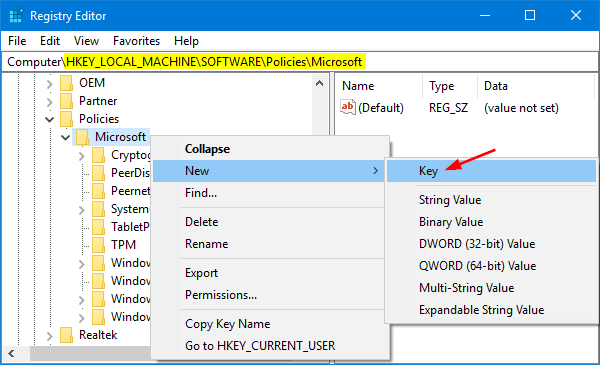 Copy and paste the following value into the Value data box, and click OK.
Close Registry Editor and open the Folder Properties dialog, it should restore the missing Sharing tab. Navigation pane missing from File Explorer in Windows 10? By default, Windows Explorer will display the navigation pane in the left-hand column, which gives you quick access to the most frequently used items like This PC, Network, Quick access and so on. If you don’t like the navigation pane, it’s very easy to get rid of it. 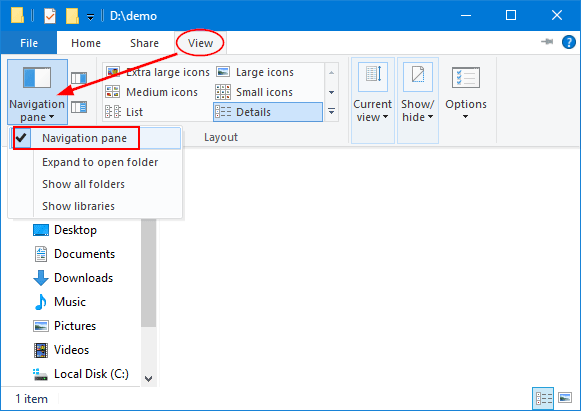 In this tutorial we’ll show you 2 ways to hide / show navigation pane in Windows Explorer (or File Explorer). Press the Windows key + E hotkey to open Windows Explorer. Click the View tab, and then click the Navigation pane button in the ribbon. In the drop-down menu, you can click to check or uncheck the “Navigation pane” option. When it’s unchecked, the navigation pane will disappear from Windows Explorer. Download one of the following registry files and save it on your desktop. Next, right-click on the .reg file and select Merge. If prompted by UAC, click on Yes. Click on Yes to confirm that you want to add the registry keys. Close all Explorer windows that are currently open, and re-launch Windows Explorer. You’ll see that the navigation pane is shown or hidden in File Explorer as you expected. How can I determine if my disk is formatted as GPT or MBR? Since the release of Windows 8, GPT partition style is becoming a popular alternative as newer computers are shipping with UEFI firmware, and Windows 10/8 can only boot from GPT disk on UEFI-based computers. 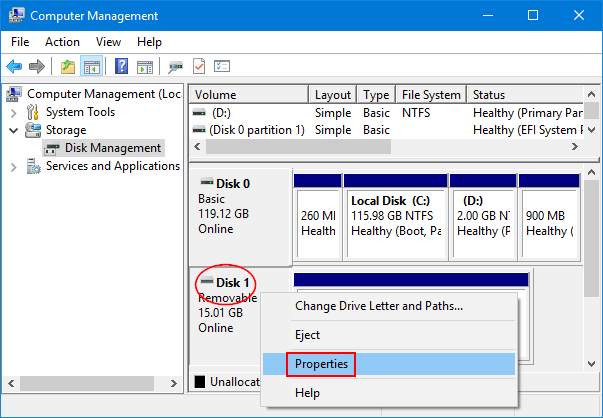 In this tutorial you’ll learn how to find out where your disk uses MBR or GPT partition style in Windows. Press Windows key + X on your keyboard, and then select Computer Management from the pop-up menu. Click on Disk Management, which appears in the left-hand side under the heading Storage. Right-click on the hard drive available in the center of the window, then select Properties. This will bring up the Device Properties window. 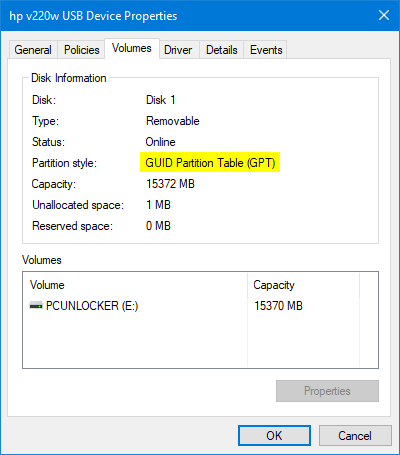 Click the Volumes tab and you’ll see if the partition style of your disk is GUID Partition Table (GPT) or Master Boot Record (MBR). Open the Command Prompt with administrative rights. At the Command Prompt, type following commands one by one, pressing Enter after each. It will list all disks that are connected to your PC. 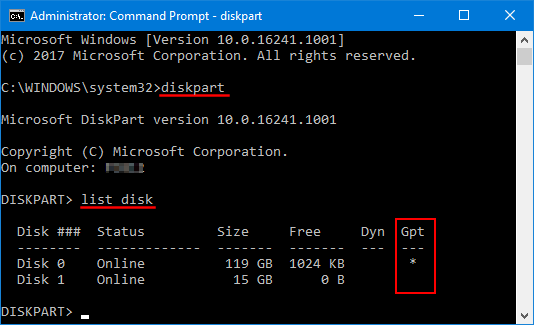 If a disk uses GPT, you’ll see an asterisk character (*) under the Gpt column. As you can see in the screenshot above, disk 0 is a GPT disk while disk 1 is a MBR disk. Is it possible to create a hidden account in our home computer? If you share a computer, you might not want everyone who uses your PC to see your username at the login screen. In this tutorial we’ll show you 2 options to create a hidden administrator account in Windows 10 / 8 / 7 from the Command Prompt. Copy and paste the code below in the Command Prompt. Replace 123 with your own password and pcunlocker with your administrator name. Once you press Enter, a new administrator account will be created but it is set to be disabled. A disabled user will not show up at Windows login screen until you enable it. Copy and paste the following code in the Command Prompt. 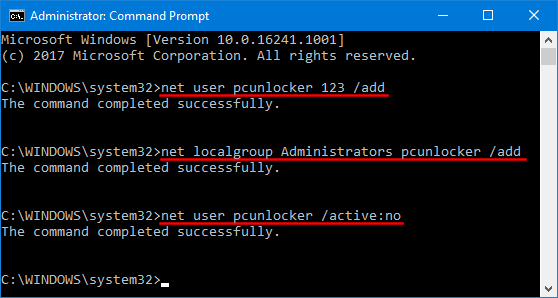 Replace 123 with your own password and pcunlocker with your administrator name. 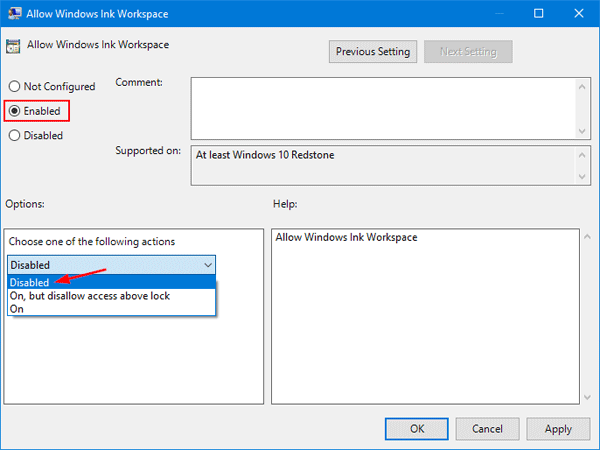 This will create a hidden administrator account which is invisible in both your Windows login screen and Fast User Switch menu, though you’ll still be able to manually login via remote desktop. Administrative Tools is the most commonly used Control Panel applet, which gives you access to a variety of advanced tools in Windows, like Computer Management, Services, Event Viewer, Local Security Policy, etc. 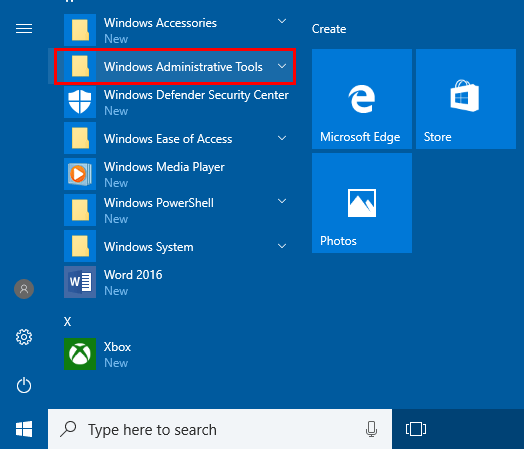 In this tutorial we’ll show you 4 simple ways to launch Administrative Tools in Windows 10. Click the Start button in the lower left corner of your screen. 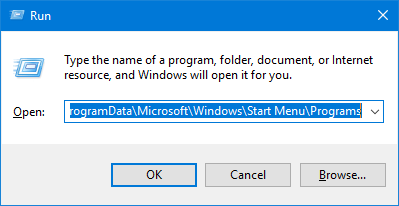 When the Start Menu opens, scroll down and expand Windows Administrative Tools, and you can then click on the administrative tool you want to open. 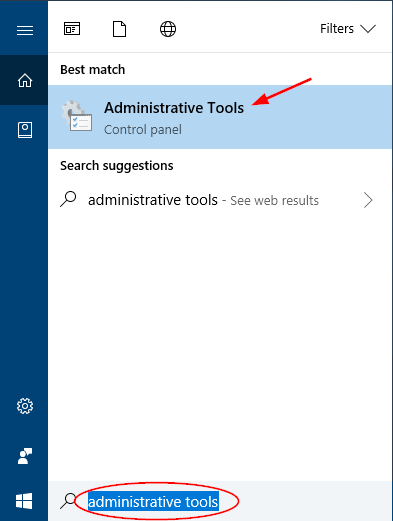 In the Cortana Search box on the taskbar, type “administrative tools” and then click or tap the Administrative Tools search result. Press the Windows key + R to open the Run window. Type control admintools and hit Enter. This will open the Administrative Tools applet immediately. 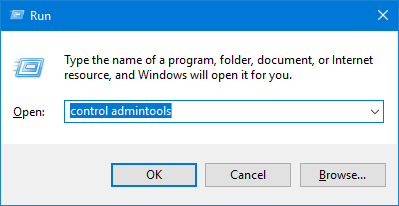 Another method that works in all Windows operating systems is to type control admintools in the Command Prompt. Open the Control Panel and then choose “Large icons” under the View by option. You can then click Administrative Tools to launch it. Control Panel is the centralized configuration area in Windows. It contains a collection of applets (System Properties, Administrative Tools, Add/Remove Programs, Date/Time, etc) that let you make changes to various settings of your system. If you share a computer with others, you may not want users to access certain applets in Control Panel. 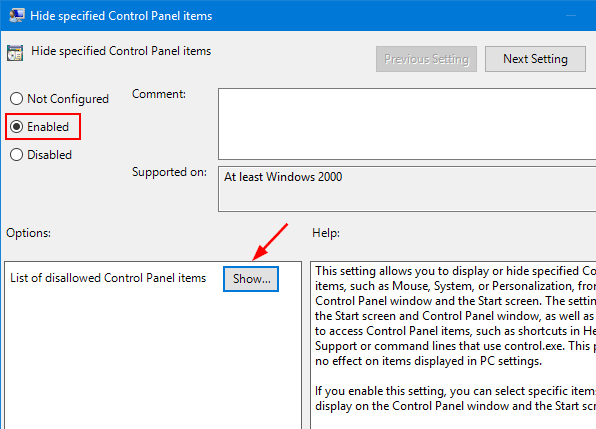 In this tutorial we’ll walk you through the steps to hide specific Control Panel items (applets) and stop others from changing certain settings in Windows 10, 8 and 7. How to Hide Specific Control Panel Items in Windows 10 / 8 / 7? 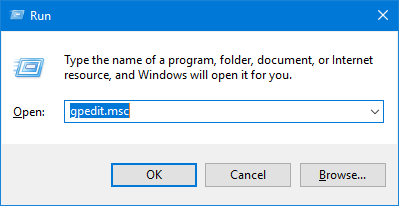 After logging on, open the Local Group Policy Editor by pressing Windows + R keys and then typing gpedit.msc in the Run box. 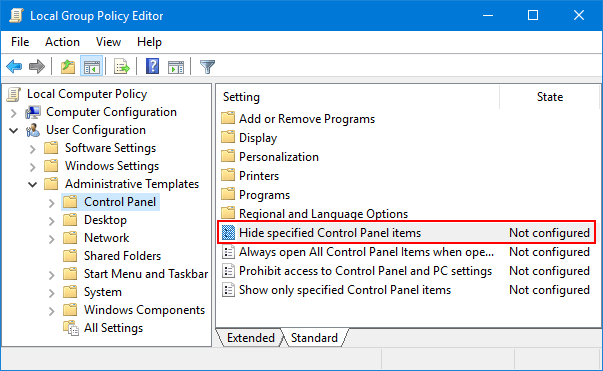 In the Local Group Policy Editor, navigate to User Configuration > Administrative Templates > Control Panel. Double-click Hide specified Control Panel items in the right pane. 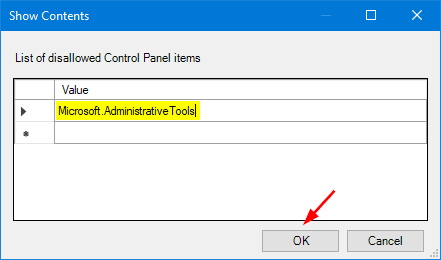 Enter the canonical name of the Control Panel item you want to hide, and click OK. For instance, if you want to restrict users from accessing Administrative Tools, enter Microsoft.AdministrativeTools in the Show Contents dialog. How to find out the canonical name of a Control Panel applet? Please check the list below. Close the Local Group Policy Editor and reboot your computer. Your specified item /applet will not show up in the Control Panel any longer. 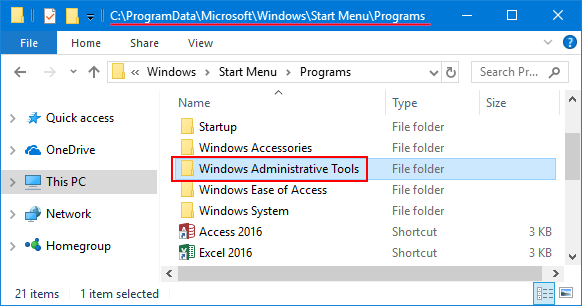 How do I hide Administrative Tools on the Start Menu? Administrative Tools is a folder that contains a collection of system maintenance tools for advanced users. 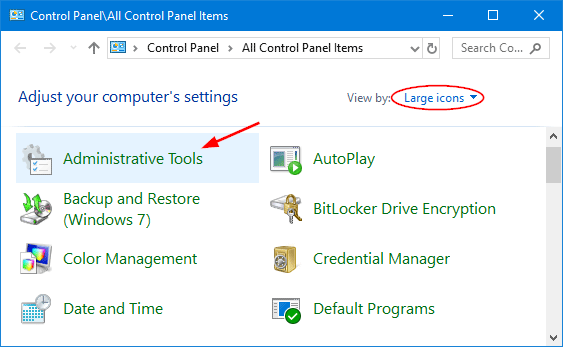 If you are system administrator, you may want to hide, remove or disable Administrative Tools in Windows 10 and prevent others from using them. 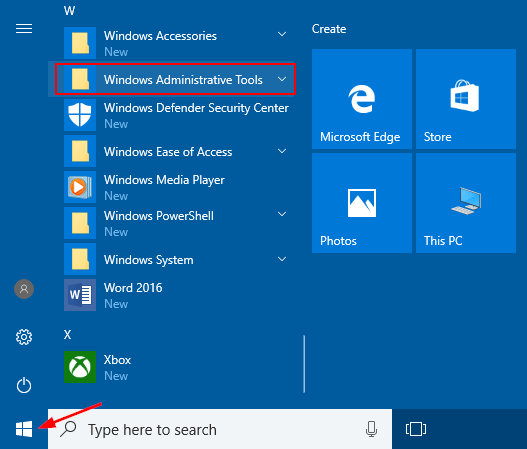 In this tutorial we’ll show you how to hide / remove Administrative Tools from Start Menu in Windows 10, without deleting any files on your computer. 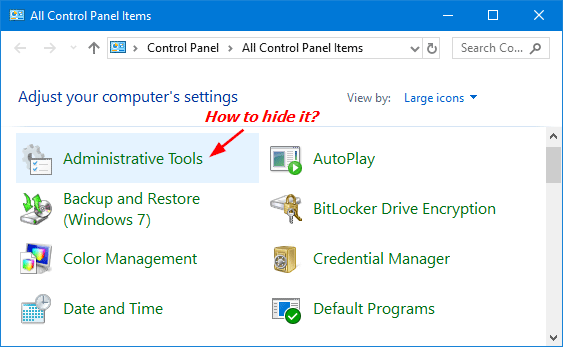 How to Hide / Remove Administrative Tools from Windows 10 Start Menu? Press the Windows key + R hotkey to open the Run box. Type the following path and hit Enter. File Explorer will open the Programs folder on the Start Menu. From there you can see the “Windows Administrative Tools” folder that you want to restrict others from accessing. 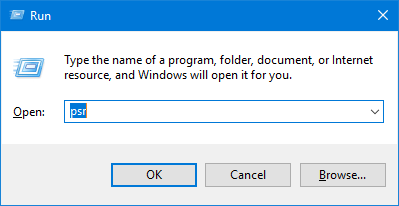 In order to hide / remove Administrative Tools from Start Menu, you have to download and install the Protect My Folders program on your computer. Protect My Folders will ask you to set a password the first time you launch it. When you get to its main interface, drag the “Windows Administrative Tools” folder from File Explorer, and then drop it into the program. Your folder will be locked and hidden from File Explorer. 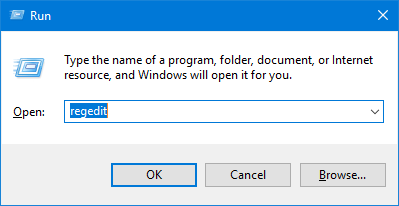 Restart your computer and you’ll find that the “Windows Administrative Tools” folder is hidden/removed from the Start Menu for all user accounts in Windows 10. If you open the Administrative Tools from Control Panel, you’ll get “Access denied” error. 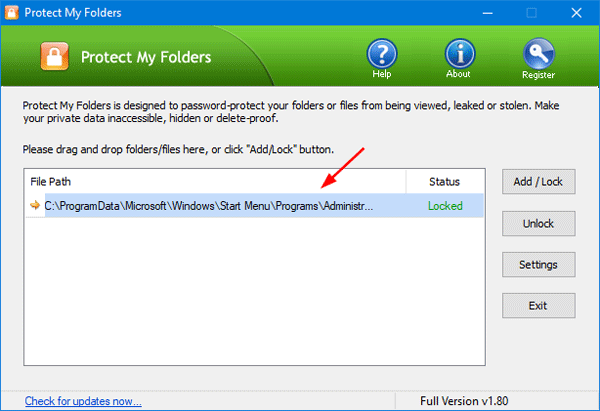 If you want to restore the Administrative Tools back to the Start Menu, just launch the Protect My Folders program again and remove your protected folder from the locked list. Reboot your PC for the Start Menu to reload. That’s it! WordPad is a basic text editor that is included with almost all versions of Windows. This tool enables you to create, edit, view, and print text documents. You can use it to open .docx file when you don’t have Office Word on your computer. 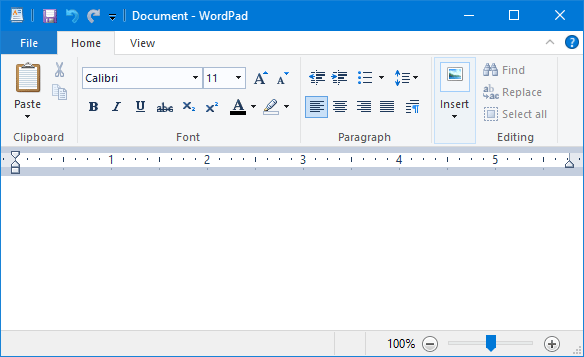 In this tutorial we’ll show you the simple ways to open WordPad in Windows 10. Tips: WordPad.exe is located in the directory: C:\Program Files\Windows NT\Accessories. If you open write.exe that resides in C:\Windows\System32, it ends up executing WordPad.exe. 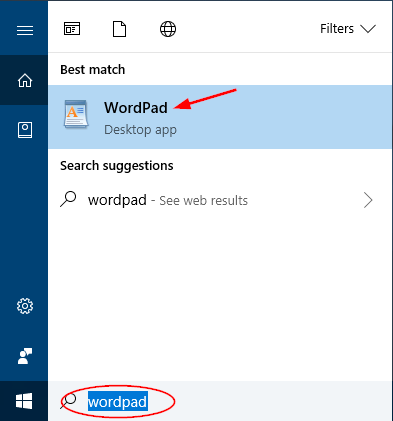 Type WordPad in Cortana Search box on the taskbar, and then click WordPad from the search result. Click the Start button. 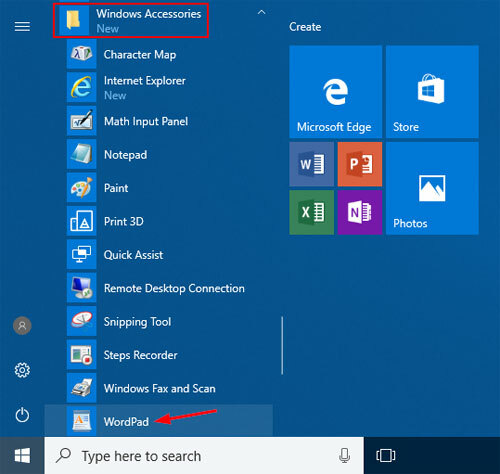 When the Start Menu opens, scroll down to the Windows Accessories folder and expand it. There you’ll find the WordPad app. Press the Windows key + R to open the Run box. Type either wordpad or write and press Enter. After opening the Command Prompt, type write and press Enter. It will launch WordPad immediately. How can I keep track of each steps I did on my computer? This is where an application built into Windows 10 called “Steps Recorder” can help. Steps Recorder makes it easy to capture steps you take on a PC, including a text description of what you did and a screenshot during each step. 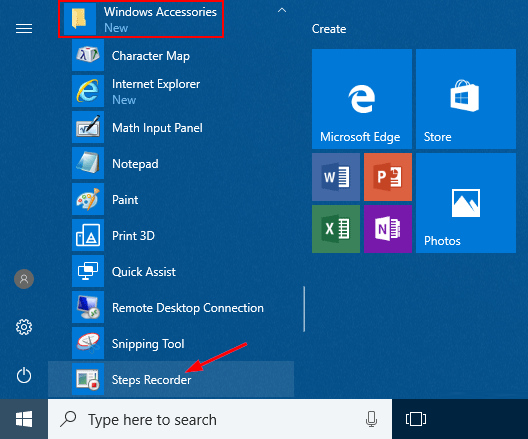 In this tutorial we’ll show you how to open and use Steps Recorder in Windows 10. 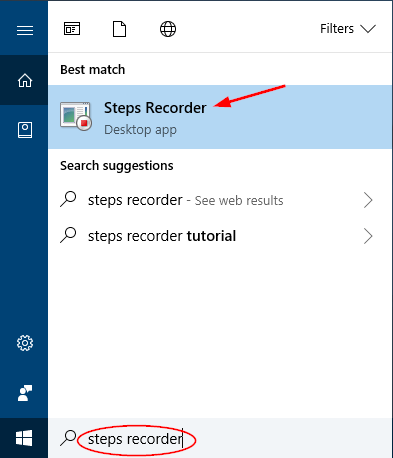 To access Steps Recorder, type “steps recorder” in the Cortana Search box on the taskbar, then click Steps Recorder app from the search result. Steps Recorder is previously known as the Problem Steps Recorder (PSR for short) in earlier versions of Windows. You can also launch it by pressing Windows + R keys and then typing psr. Another way of opening Steps Recorder is to click the Start button. When the Start Menu opens, expand the Windows Accessories folder and then click Steps Recorder. After opening the Steps Recorder application, click the “Start Record” button to begin the recording process. While Steps Recorder is recording, its title bar flashes the words “Recording Now” and its Taskbar icon shows a flashing red dot. When you finish recording, click the “Stop Record” button. You’ll see the results of the recording in a report that appears below the original Steps Recorder window. Click the Save button at the top. It will save the report in an .MHT webpage and then compress it into a ZIP file so that it can be easily emailed. 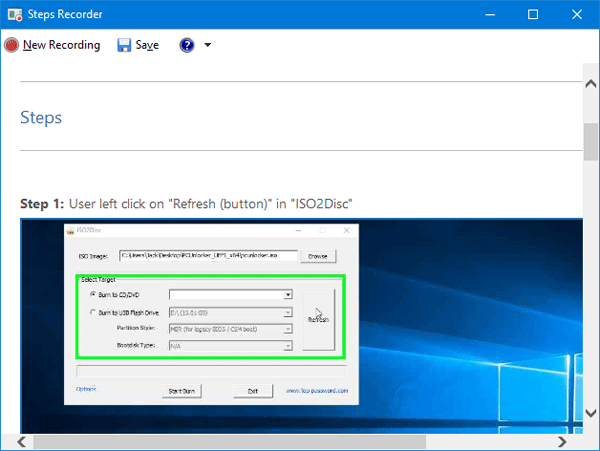 Steps Recorder is a program that helps you troubleshoot a problem in Windows 10 by recording the exact steps you took when the problem occurred. You can then send this record to a support professional to help them diagnose the problem. The program could also be used for creating annotated tutorials.